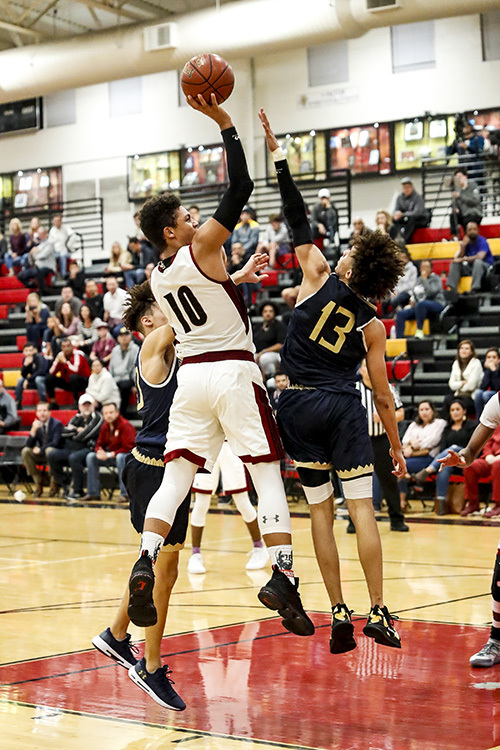 San Juan Capistrano, Calif, -- In Friday's league match, host JSerra Lions boys basketball team scored a tight 85-84 triumph over the St. John Bosco Braves in overtime. The win improves the Lions record to 15-6. With the defeat, the Braves record falls to 17-5. 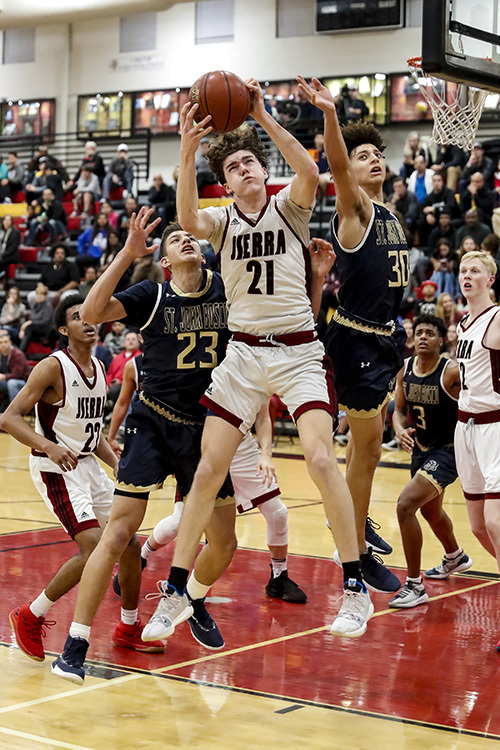 In a face paced game that saw the lead change no less than 6 times, and a tied score 5 times including at the end of regulation play, the NFHS Network live streamed match up of JSerra vs. Bosco is sure to be a contender for best game of the high school season. The outcome of the battle came down to a series of free throws by both teams in the final two minutes of overtime. 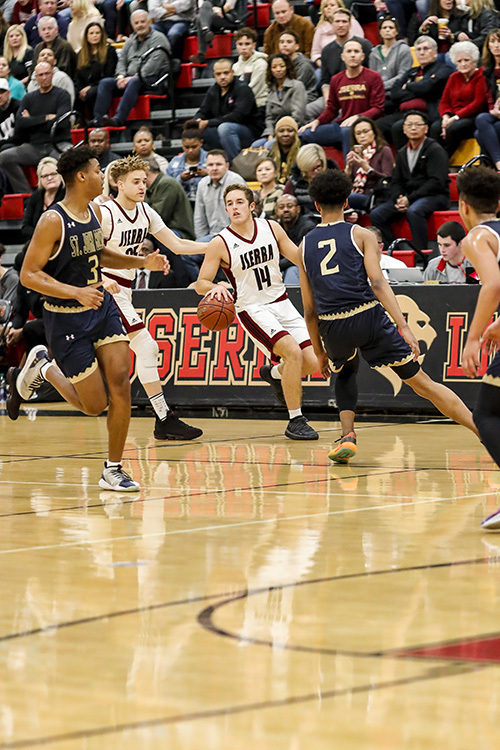 Ian Martinez took two free throws for JSerra with 6 seconds left on the clock pushing the score to JSerra's favor 85-84. 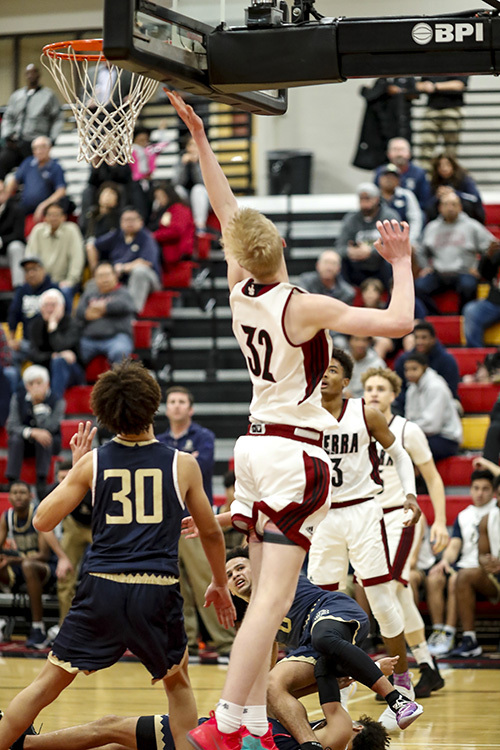 Bosco was unable to respond before the buzzer, landing the win on the side of the Lions. "We started really fast in that game and then finished when we had to," stated Head Coach Keith Wilkinson. "Our key stat of the game as going 26-30 from the FT line. Games are won and lost at the line and I was happy our guys were able to step up and knock it down." 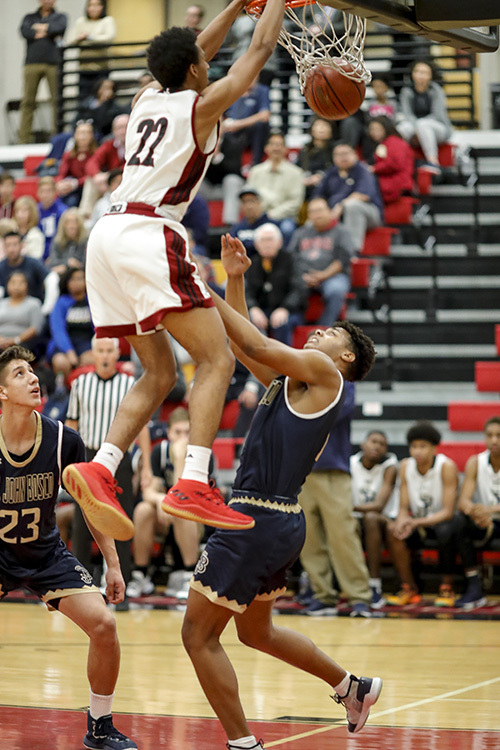 Once again 6-3, 165 junior Ian Martinez, with a gravity-defying 40-inch vertical leap, left his mark as leading scorer. Martinez put 34 points on the board for the Lions, including 16 in the first half. "Ian Martinez was unbelievable, starting the game with a dunk, catching a lob over somebody, and doing a 360 in the open court was unreal," exclaimed Coach Wilkinson. "The way he shot the ball and got his teammates involved was what makes him so special though." 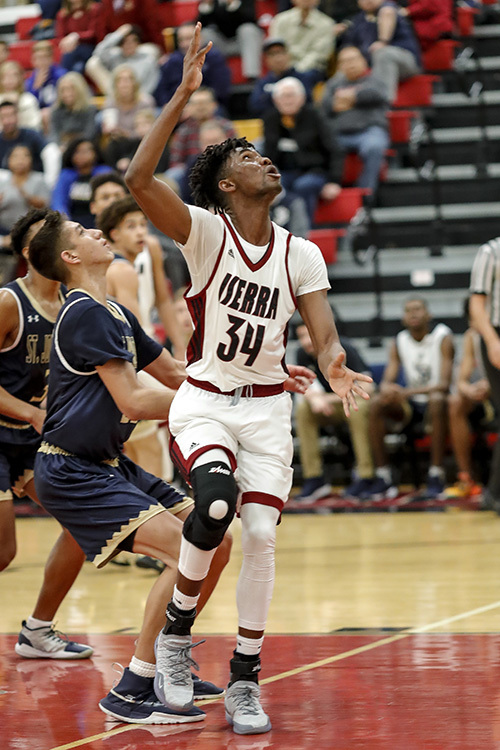 Senior forward DJ Rodman (6-4, 190) followed Martinez in scoring with 19 points for the Lions including three 3-pointers and fighting for 14 rebounds. "DJ Rodman probably played his most complete game. He scored 19 points getting face guarded the whole game," declared Coach Wilkinson. "He also rebounded the heck out of the ball and finished with 14 boards. He also was very active defensively and got a ton of deflections." 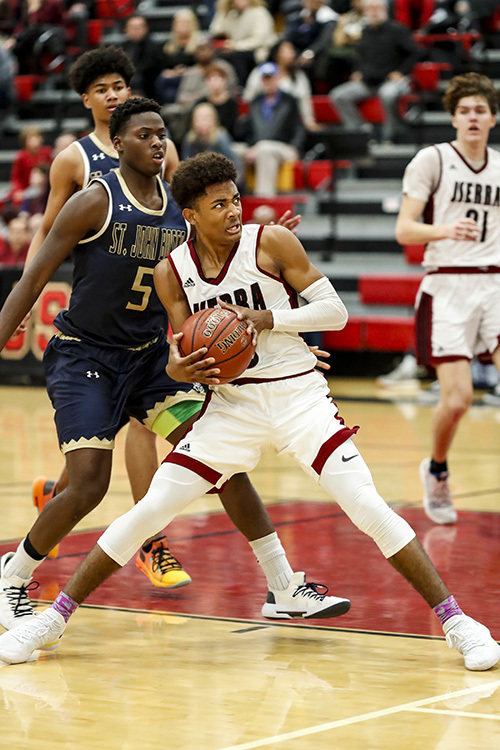 The win for JSerra was no less than a team effort with senior forward Kevin White (6-4) scoring 17 points, junior point guard Justin Williams (6-3, 165) recording 12 assists, and senior power forward Juwon Ganiyu (6-8, 176) adding 9 points. Coach Wilkinson had much to say about many of the team's contributing athletes. "Kevin White, came off the bench to score 17 points and hit some timely threes in the corner. He plays with a toughness and confidence which really helps our team. Juwon Ganiyu as the MVP of the game. He took 6 charges, had 10 rebounds and went 3 for 3 from the FT line late in the game. I could not have been more proud of Juwon, he sacrificed his body for the team time and time again. It was one of the best defensive performances I have ever seen! Justin Williams chipped in with 12 assists and controlled the pace of the game. Paxton Burzell, Hugo Clarkin, & Parker Santos flew around defensively and communicated well and came up with timely stops. " Summing up the game Coach Wilkinson shared, "I was really happy with our performance. We responded after getting our butts kicked at Mater Dei and our kids played a much better brand of basketball. It was one of the most exciting games I have been a part of at the high school level." 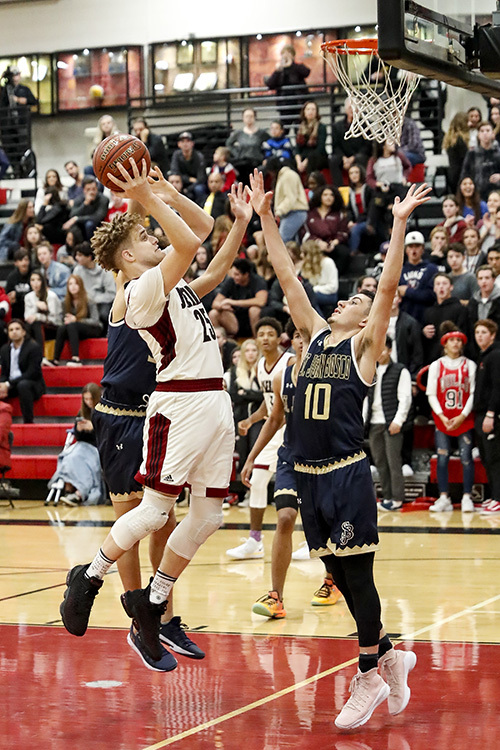 Next Up: In their next game, the Lions meet the Sage Hill Lightning (13-8) in a non-league match, on Saturday, January 12; 7:00 p.m. tip-off.